While I am traveling through Western Europe on my way to Tbilisi Georgia to work on the puppet and doll museum I have been thinking about the project ahead of me in the next few years. 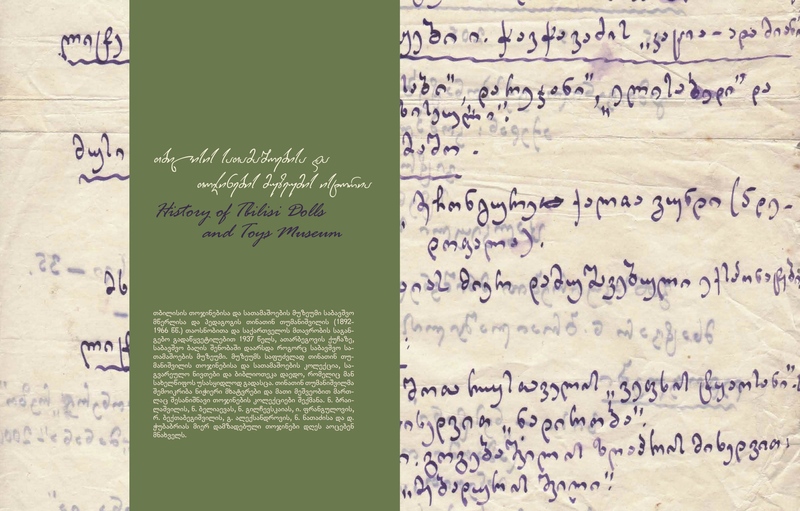 And one reminder of that task is that I have the stunning new book of the Tbilisi Dolls and Toys Museum (თბილისის სათამაშოები და თოჯინების მუზეუმი). This is a large chunk of the collection I will be working with when I eventually start my job. 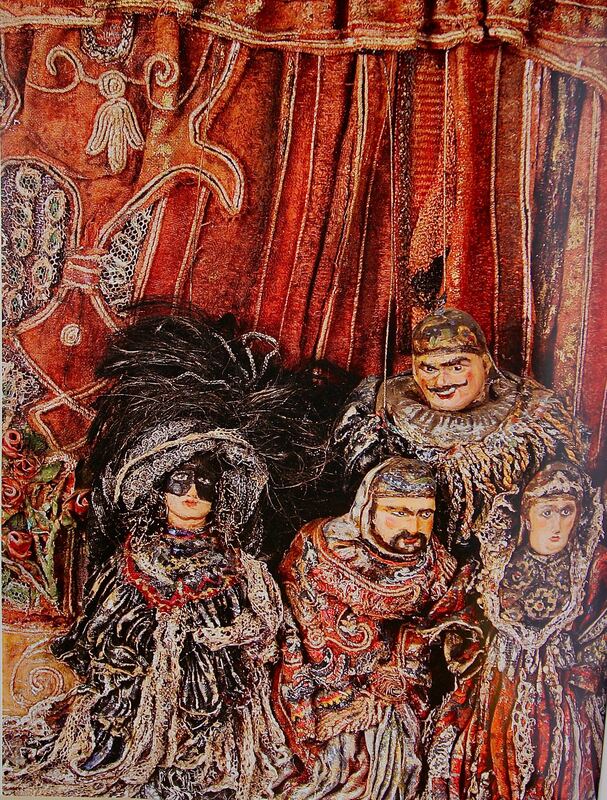 And it is a curious eye view into the world of Georgian tojinebi (plural of tojina which can mean dolls or puppets) The book is a fascinating look at the history and art of Georgia tojinebi. Tumanishvili in her role as secretary of (in typical soviet speak) The Children’s Toy Committee of the People’s Commissariat of Education who originated The Children’s Toy Museum. 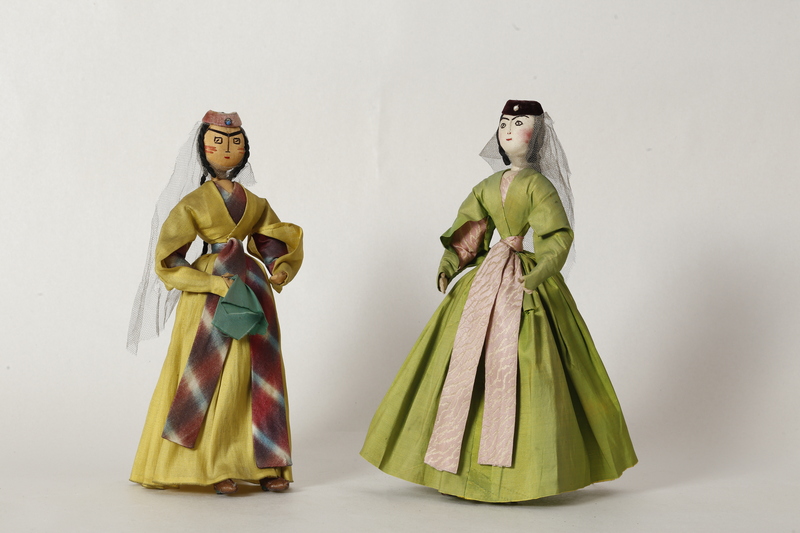 At this point there was no official style of popular doll that came from the Georgian traditions so, like puppetry in various corners of the Soviet Empire, dolls were decreed into existence. And so Tina Tumanishvili began an ethnographic search through the country to seek inspiration. And then she commissioned several dolls to be created by artists. And for me the most startlingly unique dolls are also the most primitive. 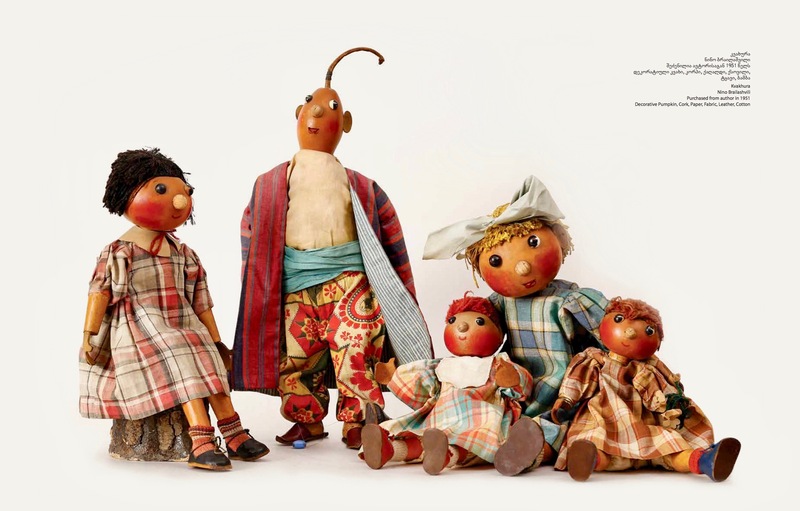 The most traditional folk dolls, called fork and spindle dolls, traditionally were made simply and beautifully with sticks, cloth and sometimes corn silk or even human hair. 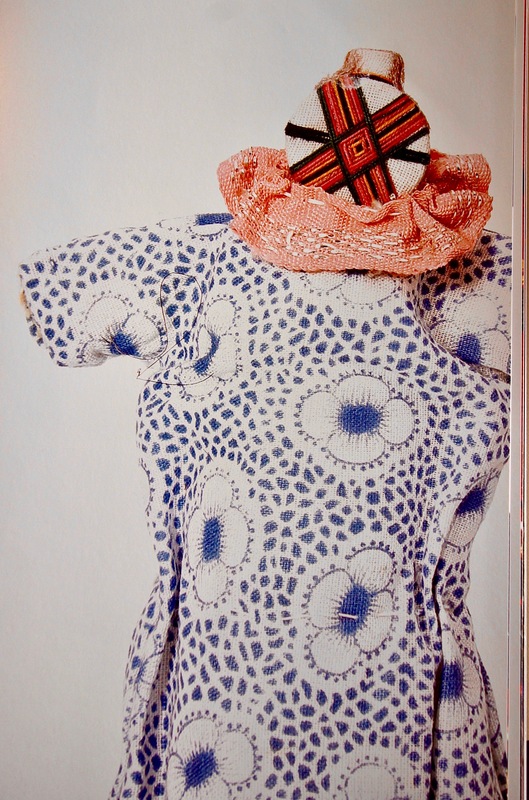 The dolls had an unusual aura to them, with the face made abstractly out of cloth, buttons, and thread or yarn with an X or a cross for a face. Often the cloth for the figure was embroidered with designs. The faces alone are enough to give the puppeteer in me many ideas for figures not yet imagined. These primitive tojinebi also connect back to a not so distant past where these figures were used in rain making ceremonies. There was one ritual of making the doll, or is it a puppet since these were also moved with simple strings at times, in the form of the biblical Lazarus. Getting the doll wet was an important part of the various rituals. And Lazarus was beseeched ‘Humidify and wet us.’ During the Gonjaoba festival a figure called the Gonja was thrown into the water, while saying ‘We do not want hard dried clods of earth anymore. God, give us the mud.’ More fearfully there was another festival the Berikaoba, which is still occasionally celebrated, with strange masks that used to be made from animal skins, particularly pig faces which were particularly used to offend the various Muslim overlords. There was also a ritual of a person or figure riding a donkey backwards who was then thrown into a river at flood stage. 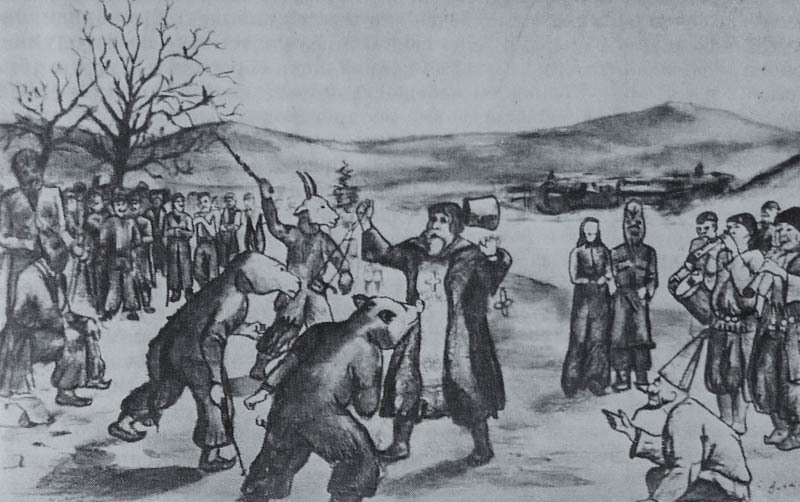 A form of this can be seen in Tengiz Abuladze’s film The Wishing Tree, where a very symbolic figure is seen riding a donkey backwards. And it isn’t a good thing. These festivals, like Mardi Gras end at the beginning of Lent. 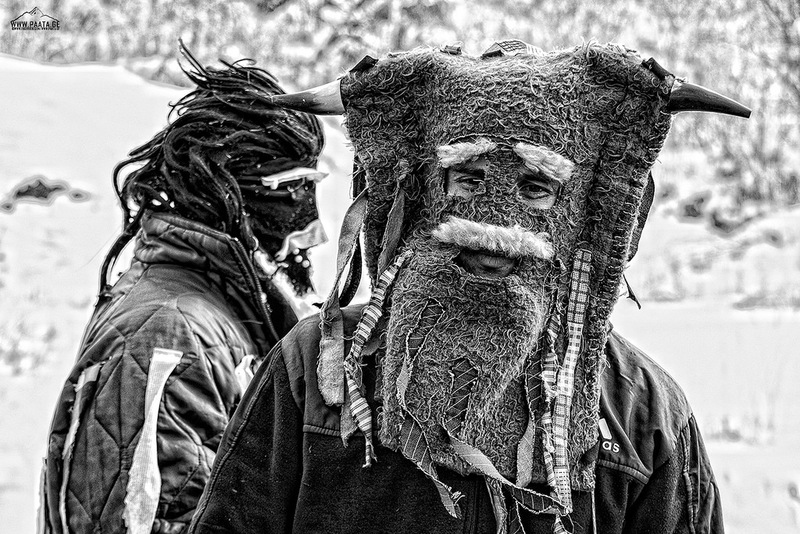 Traditional Berikaoba wearing animal masks. The catalogue pages on Berikaoba. There is another folk style involving stitching a simple expression on tightly pulled cloth. 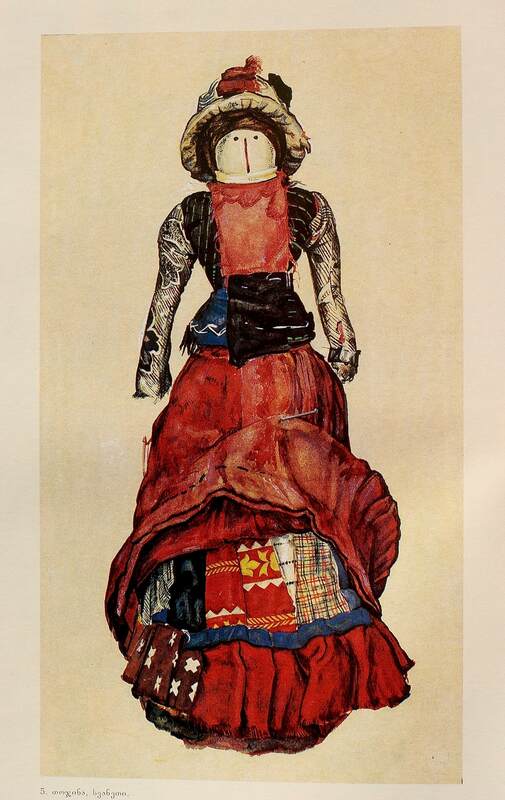 This technique as well as its extensions in design become through Tumanishvili and her artists, especially Nino Brailashvili, eventually become the inspiration and beginnings of serious doll making in Georgia. 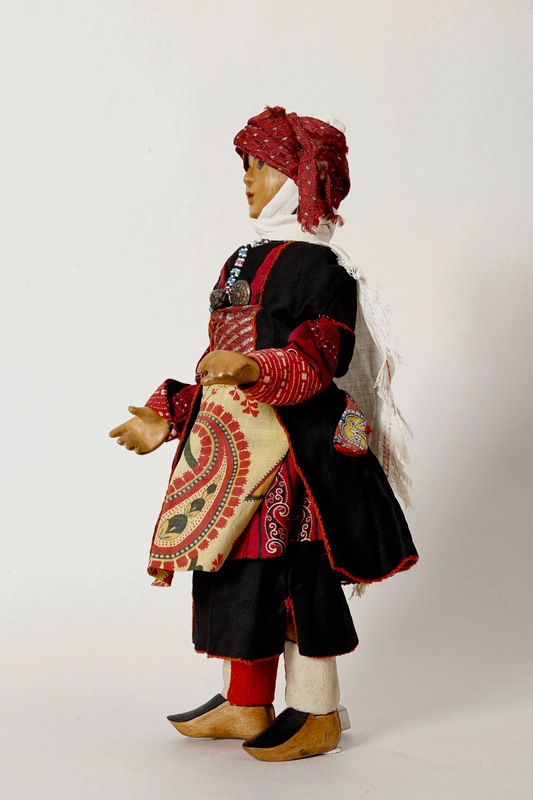 Thus Georgian doll making moves also most instantly from primitive ritualistic images straight to art, skipping the centuries of popular doll making in between. 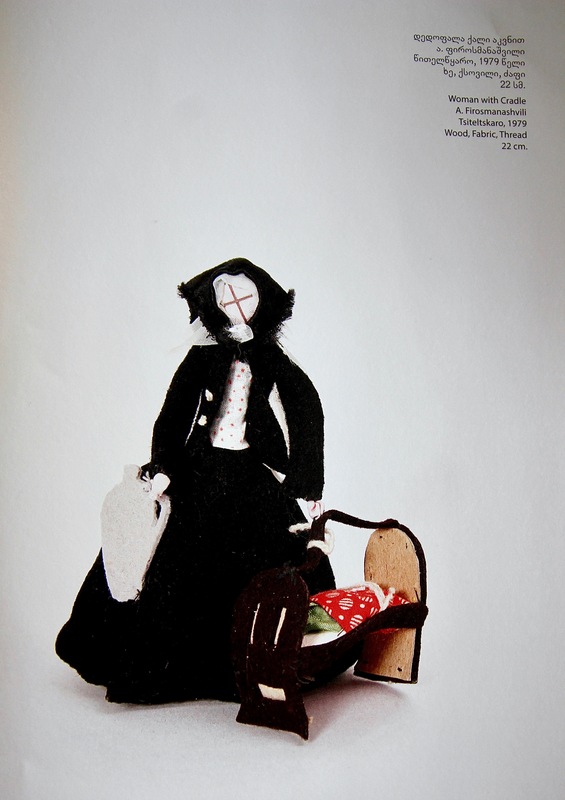 There is another worthwhile, and quite hard to find west of Russia, (in Russian and English) book featuring some of these primitive dolls and lavishly illustrated Nino Brailashvili, from her journeys into Georgia villages. 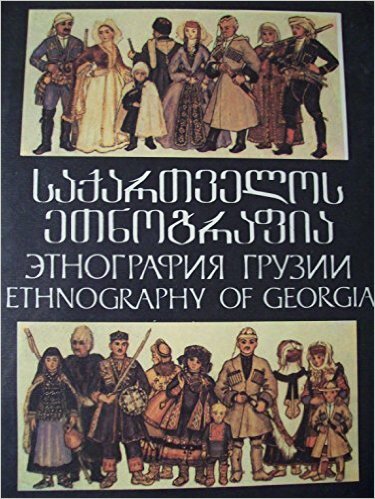 It is called Ethnography In Georgia. It is well worth seeking out. Inevitably Georgia costume design also holds an important place in the art of the tojina. Embroidery, thread and yarn all capture the elaborate patterns to be found in Georgian traditional dresses. The texture and detail of the fabric is just as important as the materials used to make the dolls. And again almost instantly created small works of art out of the tojina, blurring the line between the private fantasy of the doll and the storytelling skills of the puppet. And book of the museum’s collection shows this over and over again. Georgian tojinebi from the 1930’s. Half way between folk culture and art. 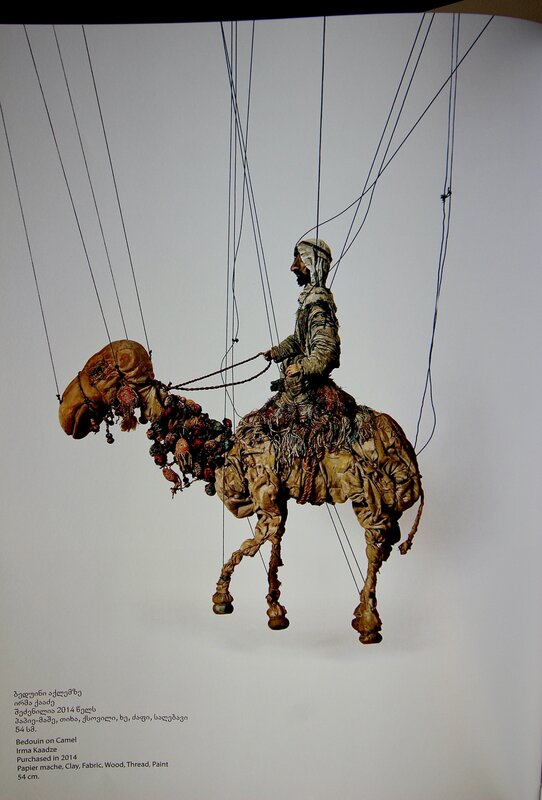 The Head of Irma Kaadze’s puppet camel. The work of Tamar Kvesitadze are also miniature statuary in a melange of materials, creating, as Kaadze does, miniature tableau vivant. 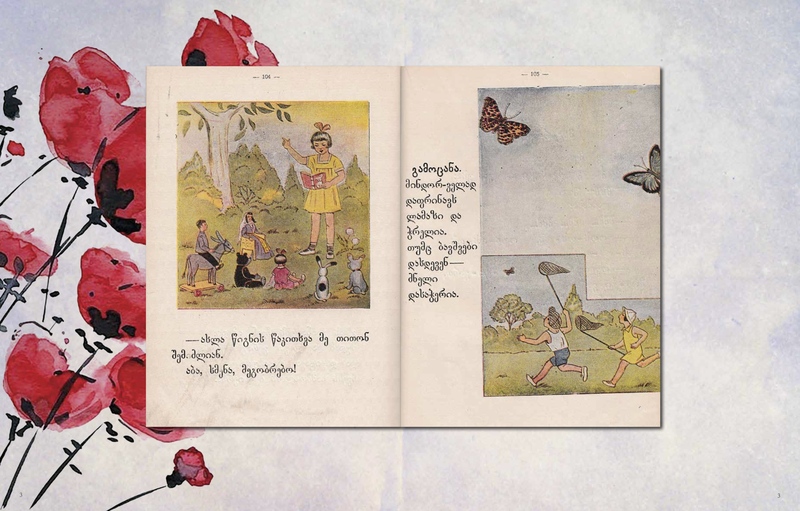 Besides the Georgian tojinebi the catalogue features mechanical toys, an automaton that blows bubbles, unknown dolls from Germany, a gift of dolls from Japan and other fragments of Georgian creative history. 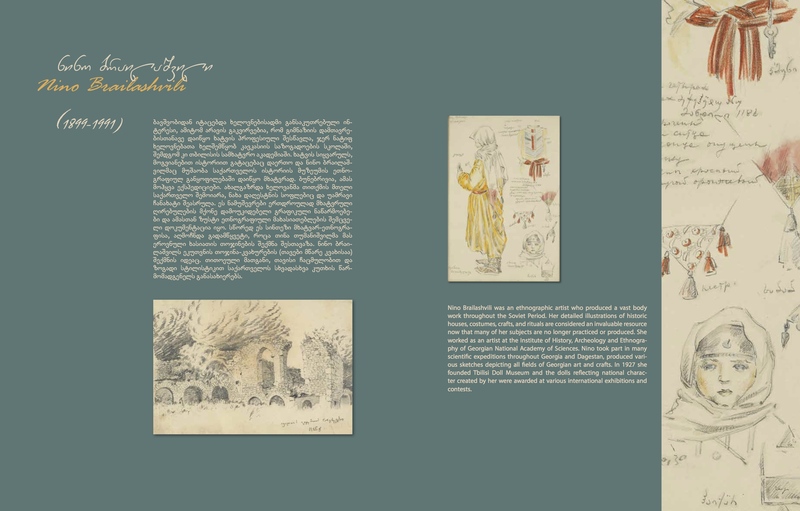 Also included in the book is artwork from the collection by such important Georgian artists as Elene Akhvlediani, Lado Gudiashvili, Natela Iankoshvili and others. Oh by the way a word about this book: It is a large gorgeously printed 288 page tome. Only 500 were made. 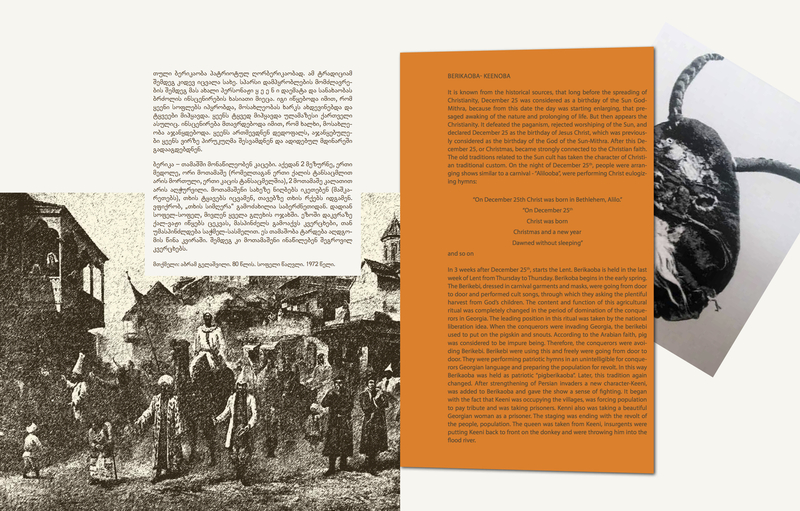 It is predominantly written in the beautiful but indecipherable Georgian script yet with plenty of English to give one a very intelligent idea of what the book is about. A reader of this essay might find themselves desperate for a copy. Getting one sent to you will not be an easy thing, but… it is possible. The actual cost of the book is mercifully not that much. But shipping? It weighs a couple of kilos (a few pounds). That will cost you more dearly. If you are one of those people curious to own it you can contact Nini Sanadiradze at the Union of Museums in Tbilisi. She can tell you how to obtain one. It cannot be found in any country other than Georgia. You can go to this page. At the bottom of that page there is a place to send email massages. Do so. And you should be able to get the information you need. 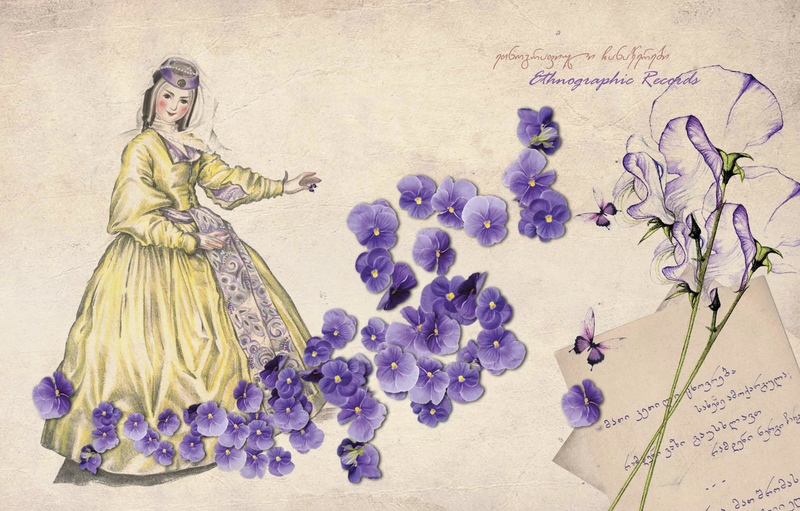 The Union of Museums also has a Facebook page. Well next time we discuss life at the International Institute of Puppetry in Charleville-Mézières France. But for now we’ll just say Au revoir and Nachwamdis. For more on my last encounter with contemporary Georgian tojinebi click this.